National Donut Day! FREE Donuts! Today is National Donut Day! If we had a Dunkin Donuts by us, I’d be there right now! You can get a free donut at both Dunkin Donuts and Krispy Kreme today. Dunkin Donuts: Get one FREE donut with any beverage purchase. Krispy Kreme: Get one complimentary donut. 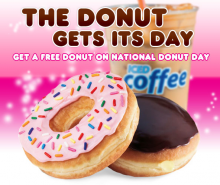 Offers Jun 3, 2011 in food, free, NationalDonutDay · Expired!